Thank heaven (or hell) for Martin van Drunen. The man has helmed some of death metal's finest in the past with Bolt Thrower and Pestilence, and currently with Hail of Bullets and Asphyx - that's a pretty darn good lineup. And with this latest offering from the latter, their eighth full-length, he once again proves he has the talent to fulfil on the promise of old-school brutality done well. Deathhammer isn't a great deal different from the general Asphyx output - traditional death metal with a large dosage of doom, making this both heavy and crushing in aural and atmospheric terms. Yet it is vastly enjoyable, a blueprint for how things should be done in the genre. Opener Into The Timewastes charges in without intro waffle, blasting drums, wall of guitar sound and van Drunen's damaged howl forming immediate atmospheric potency. A bass-led breakdown leads into crushing headbanging riffage, the sort of thing Bolt Thrower might be doing now were they still recording, sheer death metal magic. The brief yet punishing title track is used as a self-aggrandising 'we're the best'-style rant about the wayward bands that spoil death metal's true name. Very silly, of course, even without lyrics like 'vocals so poor, like frogs on a moor' but utterly convincing and heartfelt - when a song opens lyrically with 'this is true death metal you bastards!' you have to believe in what you're saying. Add to this the sort of moments of catchy riffage that Cannibal Corpse seem to use once an album, and you have a stormer of a tune at less than two and a half minutes. Yet of course, it's the slow, crawling monstrosities like the seven-minute Minefield where Asphyx really spread their talented wings, a harrowing slice of doom-death that brings the horrors of war to life. Combining the two styles with Of Days When Blades Turn Blunt makes for an oddly perfect whole, summing the band up in three minutes-odd of heaviness. You see, this is about more than riffs and blasts. Where a true doom band like Candlemass can depict gloom and the torment of a lonely soul, the mutant hybreds like Asphyx give the gloom and torment an added desperate terror, more muscular riffs and demented vocals crushing your soul even more. No offence to Candlemass (regular readers will know I love them) but this always seems a much more real, effective, grounded misery than the slightly escapist purer doom bands. If doom is a way of looking desperately for the light, doomdeath is about the horror of the moment, and the complete dominance of darkness. If doom is about bemoaning your abandonment by god and man, Asphyx are bemoaning the same whilst slowly rotting from putrefying limbs, enwrapped in barbed wire. And for a band resurrected from the grave with 2009's Death... 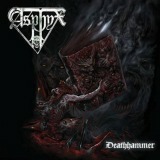 The Brutal Way, Deathhammer is more than proof enough that Asphyx made the right call in reforming. Heavy, powerful death metal that fans will love and newcomers will be stunned by.